Since I launched our FedRAMP program way back in 2013, it has always excited me to talk about how we’re continually expanding the scope of our compliance programs because that means you’re able to use more of our services for sensitive and regulated workloads. Up to this point, we’ve had 22 services in our US East/West Regions under FedRAMP Moderate and 21 services in our GovCloud Region under FedRAMP High. Today, I’m happy tell you about the latest expansion of our FedRAMP program, which makes for a 64% overall increase in FedRAMP covered services. We’ve achieved JAB authorizations for an additional 14 FedRAMP Moderate services in our US East/West Regions and three of those services also received FedRAMP High in our GovCloud Region. Check out the services below. All the services are available in the US East/West Regions, and the services with asterisks are also available in GovCloud. You can now see our updated list of authorizations on the FedRAMP Marketplace. We also list all of our services in scope by compliance program on our site. As always, our FedRAMP assessment was completed with a third-party assessment partner to ensure an independent validation of our technical, management, and operational security controls against the FedRAMP baselines. Our customer obsession starts with you. It’s been a personal goal of mine, and a point of direct feedback from you, to accelerate the pace at which we’re onboarding services into all of our compliance programs, not just FedRAMP. So, we’ll continue to work with you and with regulatory and compliance bodies around the world to ensure that we’re raising the bar on your security and compliance needs and continually earning the trust you place in us. To learn about what other public sector customers are doing on AWS, see our Government, Education, and Nonprofits Case Studies and Customer Success Stories. And certainly, stay tuned for more exciting future FedRAMP updates. The AWS US East/West Region has received a Provisional Authority to Operate (P-ATO) from the Joint Authorization Board (JAB) at the Federal Risk and Authorization Management Program (FedRAMP) Moderate baseline. Though AWS has maintained an AWS US East/West Region Agency-ATO since early 2013, this announcement represents AWS’s carefully deliberated move to the JAB for the centralized maintenance of our P-ATO for 10 services already authorized. This also includes the addition of 10 new services to our FedRAMP program (see the complete list of services below). This doubles the number of FedRAMP Moderate services available to our customers to enable increased use of the cloud and support modernized IT missions. Our public sector customers now can leverage this FedRAMP P-ATO as a baseline for their own authorizations and look to the JAB for centralized Continuous Monitoring reporting and updates. In a significant enhancement for our partners that build their solutions on the AWS US East/West Region, they can now achieve FedRAMP JAB P-ATOs of their own for their Platform as a Service (PaaS) and Software as a Service (SaaS) offerings. We continue to work with the FedRAMP Project Management Office (PMO), other regulatory and compliance bodies, and our customers and partners to ensure that we are raising the bar on our customers’ security and compliance needs. To learn more about how AWS helps customers meet their security and compliance requirements, see the AWS Compliance website. To learn about what other public sector customers are doing on AWS, see our Government, Education, and Nonprofits Case Studies and Customer Success Stories. To review the public posting of our FedRAMP authorizations, see the FedRAMP Marketplace. In this age of smart homes, big data, IoT devices, mobile phones, social networks, chatbots, and game consoles, streaming data scenarios are everywhere. Amazon Kinesis Streams enables you to build custom applications that can capture, process, analyze, and store terabytes of data per hour from thousands of streaming data sources. 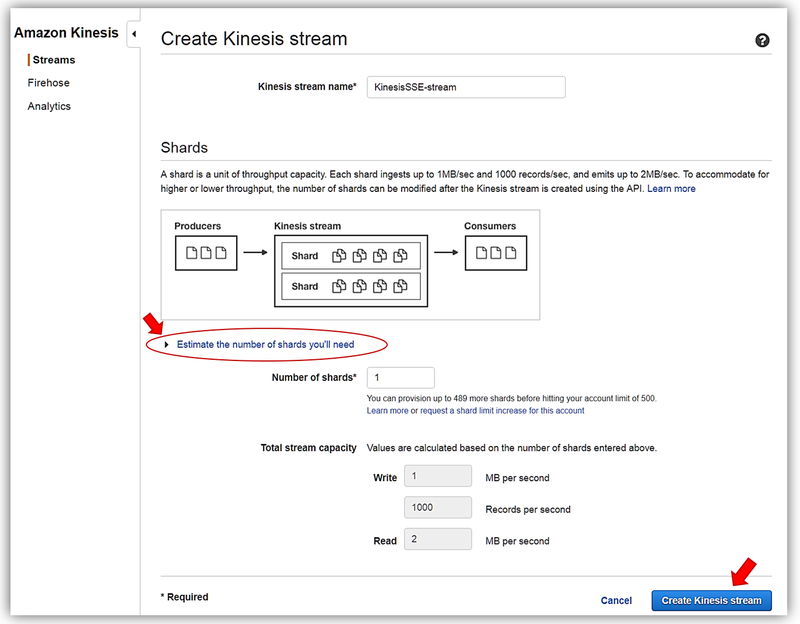 Since Amazon Kinesis Streams allows applications to process data concurrently from the same Kinesis stream, you can build parallel processing systems. For example, you can emit processed data to Amazon S3, perform complex analytics with Amazon Redshift, and even build robust, serverless streaming solutions using AWS Lambda. Kinesis Streams enables several streaming use cases for consumers, and now we are making the service more effective for securing your data in motion by adding server-side encryption (SSE) support for Kinesis Streams. With this new Kinesis Streams feature, you can now enhance the security of your data and/or meet any regulatory and compliance requirements for any of your organization’s data streaming needs. In fact, Kinesis Streams is now one of the AWS Services in Scope for the Payment Card Industry Data Security Standard (PCI DSS) compliance program. PCI DSS is a proprietary information security standard administered by the PCI Security Standards Council founded by key financial institutions. PCI DSS compliance applies to all entities that store, process, or transmit cardholder data and/or sensitive authentication data which includes service providers. 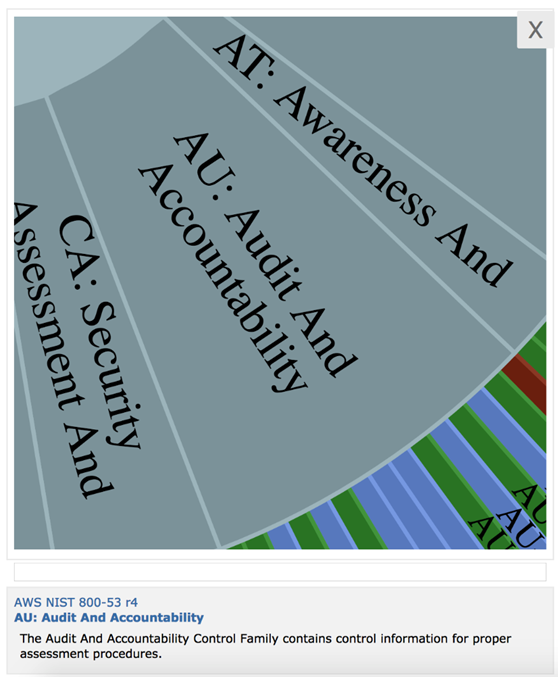 You can request the PCI DSS Attestation of Compliance and Responsibility Summary using AWS Artifact. But the good news about compliance with Kinesis Streams doesn’t stop there. Kinesis Streams is now also FedRAMP compliant in AWS GovCloud. 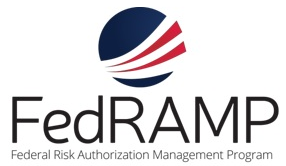 FedRAMP stands for Federal Risk and Authorization Management Program and is a U.S. government-wide program that delivers a standard approach to the security assessment, authorization, and continuous monitoring for cloud products and services. You can learn more about FedRAMP compliance with AWS Services here. Now are you ready to get into the keys? Get it, instead of get into the weeds. Okay a little corny, but it was the best I could do. Coming back to discussing SSE for Kinesis Streams, let me explain the flow of server-side encryption with Kinesis. Each data record and partition key put into a Kinesis Stream using the PutRecord or PutRecords API is encrypted using an AWS Key Management Service (KMS) master key. With the AWS Key Management Service (KMS) master key, Kinesis Streams uses the 256-bit Advanced Encryption Standard (AES-256 GCM algorithm) to add encryption to the incoming data. In order to enable server-side encryption with Kinesis Streams for new or existing streams, you can use the Kinesis management console or leverage one of the available AWS SDKs. Additionally, you can audit the history of your stream encryption, validate the encryption status of a certain stream in the Kinesis Streams console, or check that the PutRecord or GetRecord transactions are encrypted using the AWS CloudTrail service. Let’s do a quick walkthrough of server-side encryption with Kinesis Streams. 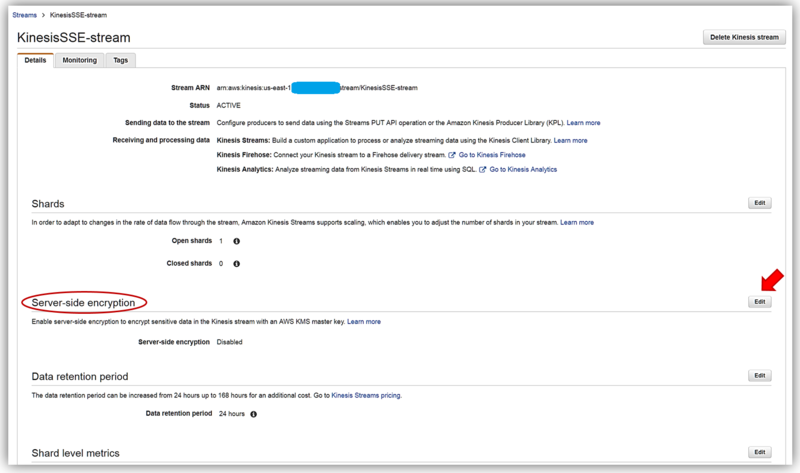 First, I’ll go to the Amazon Kinesis console and select the Streams console option. Once in the Kinesis Streams console, I can add server-side encryption to one of my existing Kinesis streams or opt to create a new Kinesis stream. For this walkthrough, I’ll opt to quickly create a new Kinesis stream, therefore, I’ll select the Create Kinesis stream button. I’ll name my stream, KinesisSSE-stream, and allocate one shard for my stream. Remember that the data capacity of your stream is calculated based upon the number of shards specified for the stream. You can use the Estimate the number of shards you’ll need dropdown within the console or read more calculations to estimate the number of shards in a stream here. To complete the creation of my stream, now I click the Create Kinesis stream button. With my KinesisSSE-stream created, I will select it in the dashboard and choose the Actions dropdown and select the Details option. On the Details page of the KinesisSSE-stream, there is now a Server-side encryption section. In this section, I will select the Edit button. Now I can enable server-side encryption for my stream with an AWS KMS master key, by selecting the Enabled radio button. Once selected I can choose which AWS KMS master key to use for the encryption of data in KinesisSSE-stream. I can either select the KMS master key generated by the Kinesis service, (Default) aws/kinesis, or select one of my own KMS master keys that I have previously generated. I’ll select the default master key and all that is left is for me to click the Save button. That’s it! As you can see from my screenshots below, after only about 20 seconds, server-side encryption was added to my Kinesis stream and now any incoming data into my stream will be encrypted. One thing to note is server-side encryption only encrypts incoming data after encryption has been enabled. Preexisting data that is in a Kinesis stream prior to server-side encryption being enabled will remain unencrypted. 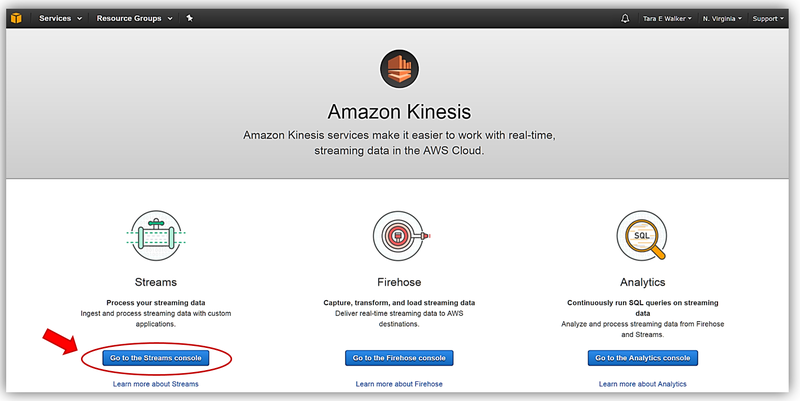 Kinesis Streams with Server-side encryption using AWS KMS keys makes it easy for you to automatically encrypt the streaming data coming into your stream. You can start, stop, or update server-side encryption for any Kinesis stream using the AWS management console or the AWS SDK. To learn more about Kinesis Server-Side encryption, AWS Key Management Service, or about Kinesis Streams review the Amazon Kinesis getting started guide, the AWS Key Management Service developer guide, or the Amazon Kinesis product page. It is time for an update on our on-going effort to make AWS a great host for healthcare and life sciences applications. As you can see from our Health Customer Stories page, Philips, VergeHealth, and Cambia (to choose a few) trust AWS with Protected Health Information (PHI) and Personally Identifying Information (PII) as part of their efforts to comply with HIPAA and HITECH. In May we announced that we added Amazon API Gateway, AWS Direct Connect, AWS Database Migration Service, and Amazon Simple Queue Service (SQS) to our list of HIPAA eligible services and discussed our how customers and partners are putting them to use. Amazon CloudFront can now be utilized to enhance the delivery and transfer of Protected Health Information data to applications on the Internet. By providing a completely secure and encryptable pathway, CloudFront can now be used as a part of applications that need to cache PHI. This includes applications for viewing lab results or imaging data, and those that transfer PHI from Healthcare Information Exchanges (HIEs). AWS WAF can now be used to protect applications running on AWS which operate on PHI such as patient care portals, patient scheduling systems, and HIEs. Requests and responses containing encrypted PHI and PII can now pass through AWS WAF. AWS Shield can now be used to protect web applications such as patient care portals and scheduling systems that operate on encrypted PHI from DDoS attacks. Amazon S3 Transfer Acceleration can now be used to accelerate the bulk transfer of large amounts of research, genetics, informatics, insurance, or payer/payment data containing PHI/PII information. Transfers can take place between a pair of AWS Regions or from an on-premises system and an AWS Region. Amazon WorkSpaces can now be used by researchers, informaticists, hospital administrators and other users to analyze, visualize or process PHI/PII data using on-demand Windows virtual desktops. AWS Directory Service can now be used to connect the authentication and authorization systems of organizations that use or process PHI/PII to their resources in the AWS Cloud. For example, healthcare providers operating hybrid cloud environments can now use AWS Directory Services to allow their users to easily transition between cloud and on-premises resources. Amazon Simple Notification Service (SNS) can now be used to send notifications containing encrypted PHI/PII as part of patient care, payment processing, and mobile applications. Amazon Cognito can now be used to authenticate users into mobile patient portal and payment processing applications that use PHI/PII identifiers for accounts. HIPAA Eligible Services Reference – The full list of HIPAA eligible AWS services. HIPAA Compliance – Details our work around HIPAA and HITECH. Health Customer Stories – A long list of videos and case studies from our healthcare and life sciences customers. Healthcare Compliance in the Cloud – A big-picture view of compliance, including HIPAA and FedRAMP, as it relates to healthcare. Healthcare Partner Solutions – Services and products from members of the AWS Partner Network. Architecting for HIPAA in the Cloud – Architectural strategies and resources. 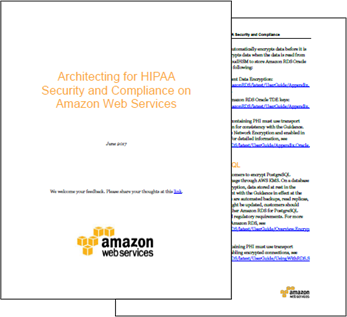 AWS HIPAA Compliance Whitepaper – A comprehensive guide to architecting for HIPAA. In order to make use of any AWS service in any manner that involves PHI, you must first enter into an AWS Business Associate Addendum (BAA). You can contact us to start the process. AWS GovCloud (US) gives AWS customers a place to host sensitive data and regulated workloads in the AWS Cloud. 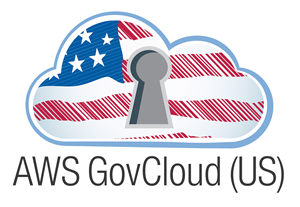 The first AWS GovCloud (US) Region was launched in 2011 and is located on the west coast of the US. I’m happy to announce that we are working on a second Region that we expect to open in 2018. The upcoming AWS GovCloud (US-East) Region will provide customers with added redundancy, data durability, and resiliency, and will also provide additional options for disaster recovery. Like the existing region, which we now call AWS GovCloud (US-West), the new region will be isolated and meet top US government compliance requirements including International Traffic in Arms Regulations (ITAR), NIST standards, Federal Risk and Authorization Management Program (FedRAMP) Moderate and High, Department of Defense Impact Levels 2-4, DFARs, IRS1075, and Criminal Justice Information Services (CJIS) requirements. Visit the GovCloud (US) page to learn more about the compliance regimes that we support. Federal (US) Government – Department of Veterans Affairs, General Services Administration 18F (Digital Services Delivery), NASA JPL, Defense Digital Service, United States Air Force, United States Department of Justice. Regulated Industries – CSRA, Talen Energy, Cobham Electronics. SaaS and Solution Providers – FIGmd, Blackboard, Splunk, GitHub, Motorola. Federal, state, and local agencies that want to move their existing applications to the AWS Cloud can take advantage of the AWS Cloud Adoption Framework (CAF) offered by AWS Professional Services. Today, we’re pleased to announce an array of AWS services that are available in the AWS GovCloud (US) Region and have achieved Federal Risk and Authorization Management Program (FedRAMP) High authorizations. The FedRAMP Joint Authorization Board (JAB) has issued Provisional Authority to Operate (P-ATO) approvals, which are effective immediately. If you are a federal or commercial customer, you can use these services to process and store your critical workloads in the AWS GovCloud (US) Region’s authorization boundary with data up to the high impact level. The services newly available in the AWS GovCloud (US) Region include database, storage, data warehouse, security, and configuration automation solutions that will help you increase your ability to manage data in the cloud. 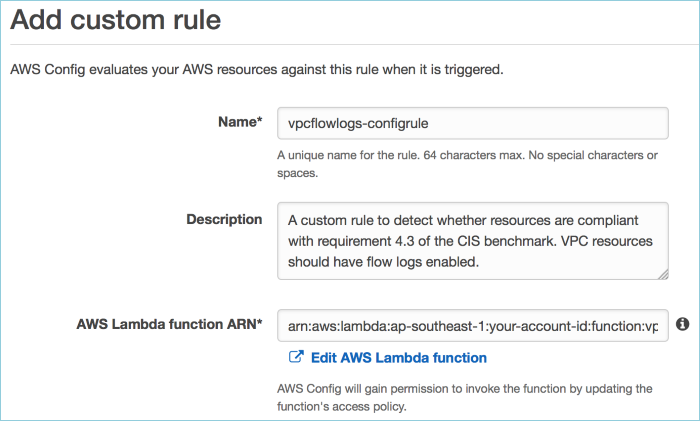 For example, with AWS CloudFormation, you can deploy AWS resources by automating configuration processes. AWS Key Management Service (KMS) enables you to create and control the encryption keys used to secure your data. Amazon Redshift enables you to analyze all your data cost effectively by using existing business intelligence tools to automate common administrative tasks for managing, monitoring, and scaling your data warehouse. CloudFormation – CloudFormation gives developers and systems administrators an easy way to create and manage a collection of related AWS resources, provisioning and updating them in an orderly and predictable fashion. You can use sample templates in CloudFormation, or create your own templates to describe the AWS resources and any associated dependencies or run-time parameters required to run your application. Amazon DynamoDB – Amazon DynamoDB is a fast and flexible NoSQL database service for all applications that need consistent, single-digit-millisecond latency at any scale. It is a fully managed cloud database and supports both document and key-value store models. Amazon EMR – Amazon EMR provides a managed Hadoop framework that makes it efficient and cost effective to process vast amounts of data across dynamically scalable Amazon EC2 instances. You can also run other popular distributed frameworks such as Apache Spark, HBase, Presto, and Flink in EMR, and interact with data in other AWS data stores such as Amazon S3 and DynamoDB. Amazon Glacier – Amazon Glacier is a secure, durable, and low-cost cloud storage service for data archiving and long-term backup. Customers can reliably store large or small amounts of data for as little as $0.004 per gigabyte per month, a significant savings compared to on-premises solutions. KMS – KMS is a managed service that makes it easier for you to create and control the encryption keys used to encrypt your data, and uses Hardware Security Modules (HSMs) to protect the security of your keys. KMS is integrated with other AWS services to help you protect the data you store with these services. For example, KMS is integrated with CloudTrail to provide you with logs of all key usage and help you meet your regulatory and compliance needs. Redshift – Redshift is a fast, fully managed, petabyte-scale data warehouse that makes it simple and cost effective to analyze all your data by using your existing business intelligence tools. Amazon Simple Notification Service (SNS) – Amazon SNS is a fast, flexible, fully managed push notification service that lets you send individual messages or “fan out” messages to large numbers of recipients. SNS makes it simple and cost effective to send push notifications to mobile device users and email recipients or even send messages to other distributed services. Amazon Simple Queue Service (SQS) – Amazon SQS is a fully-managed message queuing service for reliably communicating among distributed software components and microservices—at any scale. Using SQS, you can send, store, and receive messages between software components at any volume, without losing messages or requiring other services to be always available. Amazon Simple Workflow Service (SWF) – Amazon SWF helps developers build, run, and scale background jobs that have parallel or sequential steps. SWF is a fully managed state tracker and task coordinator in the cloud. AWS works closely with the FedRAMP Program Management Office (PMO), National Institute of Standards and Technology (NIST), and other federal regulatory and compliance bodies to ensure that we provide you with the cutting-edge technology you need in a secure and compliant fashion. We are working with our authorizing officials to continue to expand the scope of our authorized services, and we are fully committed to ensuring that AWS GovCloud (US) continues to offer government customers the most comprehensive mix of functionality and security. In case you missed any AWS Security Blog posts published so far in 2017, they are summarized and linked to below. The posts are shown in reverse chronological order (most recent first), and the subject matter ranges from protecting dynamic web applications against DDoS attacks to monitoring AWS account configuration changes and API calls to Amazon EC2 security groups. Using a content delivery network (CDN) such as Amazon CloudFront to cache and serve static text and images or downloadable objects such as media files and documents is a common strategy to improve webpage load times, reduce network bandwidth costs, lessen the load on web servers, and mitigate distributed denial of service (DDoS) attacks. AWS WAF is a web application firewall that can be deployed on CloudFront to help protect your application against DDoS attacks by giving you control over which traffic to allow or block by defining security rules. When users access your application, the Domain Name System (DNS) translates human-readable domain names (for example, www.example.com) to machine-readable IP addresses (for example, 192.0.2.44). A DNS service, such as Amazon Route 53, can effectively connect users’ requests to a CloudFront distribution that proxies requests for dynamic content to the infrastructure hosting your application’s endpoints. In this blog post, I show you how to deploy CloudFront with AWS WAF and Route 53 to help protect dynamic web applications (with dynamic content such as a response to user input) against DDoS attacks. The steps shown in this post are key to implementing the overall approach described in AWS Best Practices for DDoS Resiliency and enable the built-in, managed DDoS protection service, AWS Shield. 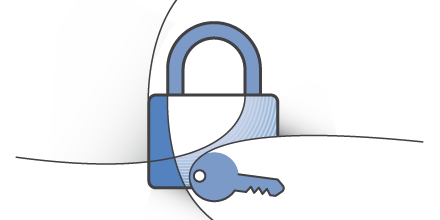 The AWS Cryptography team is happy to announce a Python implementation of the AWS Encryption SDK. This new SDK helps manage data keys for you, and it simplifies the process of encrypting data under multiple master keys. As a result, this new SDK allows you to focus on the code that drives your business forward. It also provides a framework you can easily extend to ensure that you have a cryptographic library that is configured to match and enforce your standards. The SDK also includes ready-to-use examples. If you are a Java developer, you can refer to this blog post to see specific Java examples for the SDK. In this blog post, I show you how you can use the AWS Encryption SDK to simplify the process of encrypting data and how to protect your encryption keys in ways that help improve application availability by not tying you to a single region or key management solution. The need for guidance when implementing Criminal Justice Information Services (CJIS)–compliant solutions has become of paramount importance as more law enforcement customers and technology partners move to store and process criminal justice data in the cloud. AWS services allow these customers to easily and securely architect a CJIS-compliant solution when handling criminal justice data, creating a durable, cost-effective, and secure IT infrastructure that better supports local, state, and federal law enforcement in carrying out their public safety missions. AWS has created several documents (collectively referred to as the CJIS Workbook) to assist you in aligning with the FBI’s CJIS Security Policy. You can use the workbook as a framework for developing CJIS-compliant architecture in the AWS Cloud. The workbook helps you define and test the controls you operate, and document the dependence on the controls that AWS operates (compute, storage, database, networking, regions, Availability Zones, and edge locations). Today, we made available a new Cloud Directory API, ListObjectParentPaths, that enables you to retrieve all available parent paths for any directory object across multiple hierarchies. Use this API when you want to fetch all parent objects for a specific child object. The order of the paths and objects returned is consistent across iterative calls to the API, unless objects are moved or deleted. In case an object has multiple parents, the API allows you to control the number of paths returned by using a paginated call pattern. In this blog post, I use an example directory to demonstrate how this new API enables you to retrieve data across multiple dimensions to implement powerful applications quickly. AWS Directory Service for Microsoft Active Directory, also known as AWS Microsoft AD, is a managed Microsoft Active Directory (AD) hosted in the AWS Cloud. Now, AWS Microsoft AD makes it easy for you to give your users permission to manage AWS resources by using on-premises AD administrative tools. With AWS Microsoft AD, you can grant your on-premises users permissions to resources such as the AWS Management Console instead of adding AWS Identity and Access Management (IAM) user accounts or configuring AD Federation Services (AD FS) with Security Assertion Markup Language (SAML). In this blog post, I show how to use AWS Microsoft AD to enable your on-premises AD users to sign in to the AWS Management Console with their on-premises AD user credentials to access and manage AWS resources through IAM roles. Distributed Denial of Service (DDoS) attacks are attempts by a malicious actor to flood a network, system, or application with more traffic, connections, or requests than it is able to handle. To protect your web application against DDoS attacks, you can use AWS Shield, a DDoS protection service that AWS provides automatically to all AWS customers at no additional charge. You can use AWS Shield in conjunction with DDoS-resilient web services such as Amazon CloudFront and Amazon Route 53 to improve your ability to defend against DDoS attacks. Learn more about architecting for DDoS resiliency by reading the AWS Best Practices for DDoS Resiliency whitepaper. You also have the option of using Route 53 with an externally hosted content delivery network (CDN). In this blog post, I show how you can help protect the zone apex (also known as the root domain) of your web application by using Route 53 to perform a secure redirect to prevent discovery of your application origin. Today, AWS Organizations moves from Preview to General Availability. You can use Organizations to centrally manage multiple AWS accounts, with the ability to create a hierarchy of organizational units (OUs). You can assign each account to an OU, define policies, and then apply those policies to an entire hierarchy, specific OUs, or specific accounts. You can invite existing AWS accounts to join your organization, and you can also create new accounts. All of these functions are available from the AWS Management Console, the AWS Command Line Interface (CLI), and through the AWS Organizations API.To read the full AWS Blog post about today’s launch, see AWS Organizations – Policy-Based Management for Multiple AWS Accounts. Today, we’ve achieved another important milestone for securing customer data: we have replaced OpenSSL with s2n for all internal and external SSL traffic in Amazon Simple Storage Service (Amazon S3) commercial regions. This was implemented with minimal impact to customers, and multiple means of error checking were used to ensure a smooth transition, including client integration tests, catching potential interoperability conflicts, and identifying memory leaks through fuzz testing. AWS Identity and Access Management (IAM) roles enable your applications running on Amazon EC2 to use temporary security credentials. IAM roles for EC2 make it easier for your applications to make API requests securely from an instance because they do not require you to manage AWS security credentials that the applications use. Recently, we enabled you to use temporary security credentials for your applications by attaching an IAM role to an existing EC2 instance by using the AWS CLI and SDK. To learn more, see New! Attach an AWS IAM Role to an Existing Amazon EC2 Instance by Using the AWS CLI. 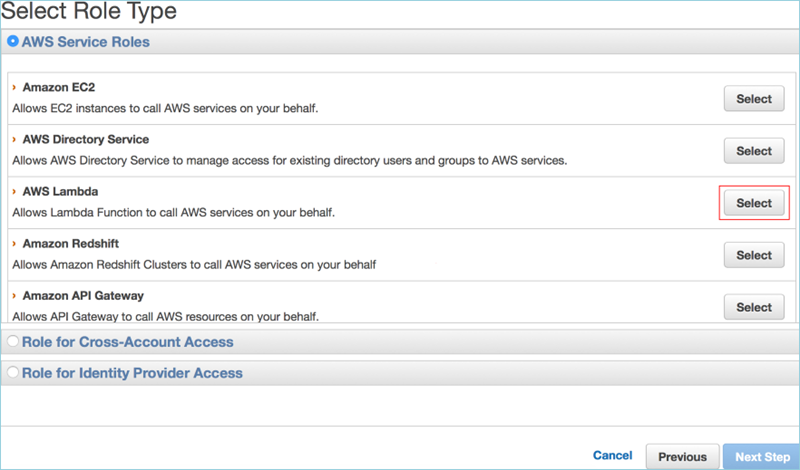 Starting today, you can attach an IAM role to an existing EC2 instance from the EC2 console. You can also use the EC2 console to replace an IAM role attached to an existing instance. In this blog post, I will show how to attach an IAM role to an existing EC2 instance from the EC2 console. I have two exciting announcements today, both showing AWS’s continued commitment to ensuring that customers can comply with EU Data Protection requirements when using our services. You can now enable multi-factor authentication (MFA) for users of AWS services such as Amazon WorkSpaces and Amazon QuickSight and their on-premises credentials by using your AWS Directory Service for Microsoft Active Directory (Enterprise Edition) directory, also known as AWS Microsoft AD. MFA adds an extra layer of protection to a user name and password (the first “factor”) by requiring users to enter an authentication code (the second factor), which has been provided by your virtual or hardware MFA solution. These factors together provide additional security by preventing access to AWS services, unless users supply a valid MFA code. Amazon Cloud Directory enables you to create directories for a variety of use cases, such as organizational charts, course catalogs, and device registries. Cloud Directory offers you the flexibility to create directories with hierarchies that span multiple dimensions. For example, you can create an organizational chart that you can navigate through separate hierarchies for reporting structure, location, and cost center. In this blog post, I show how to use Cloud Directory APIs to create an organizational chart with two separate hierarchies in a single directory. I also show how to navigate the hierarchies and retrieve data. I use the Java SDK for all the sample code in this post, but you can use other language SDKs or the AWS CLI. AWS Directory Service for Microsoft Active Directory (Enterprise Edition), also known as Microsoft AD, now enables your users to log on with just their on-premises Active Directory (AD) user name—no domain name is required. This new domainless logon feature makes it easier to set up connections to your on-premises AD for use with applications such as Amazon WorkSpaces and Amazon QuickSight, and it keeps the user logon experience free from network naming. This new interforest trusts capability is now available when using Microsoft AD with Amazon WorkSpaces and Amazon QuickSight Enterprise Edition. In this blog post, I explain how Microsoft AD domainless logon works with AD interforest trusts, and I show an example of setting up Amazon WorkSpaces to use this capability. AWS Identity and Access Management (IAM) roles enable your applications running on Amazon EC2 to use temporary security credentials that AWS creates, distributes, and rotates automatically. Using temporary credentials is an IAM best practice because you do not need to maintain long-term keys on your instance. Using IAM roles for EC2 also eliminates the need to use long-term AWS access keys that you have to manage manually or programmatically. Starting today, you can enable your applications to use temporary security credentials provided by AWS by attaching an IAM role to an existing EC2 instance. You can also replace the IAM role attached to an existing EC2 instance. In this blog post, I show how you can attach an IAM role to an existing EC2 instance by using the AWS CLI. The Amazon Inspector security assessment service can evaluate the operating environments and applications you have deployed on AWS for common and emerging security vulnerabilities automatically. As an AWS-built service, Amazon Inspector is designed to exchange data and interact with other core AWS services not only to identify potential security findings but also to automate addressing those findings. Previous related blog posts showed how you can deliver Amazon Inspector security findings automatically to third-party ticketing systems and automate the installation of the Amazon Inspector agent on new Amazon EC2 instances. In this post, I show how you can automatically remediate findings generated by Amazon Inspector. To get started, you must first run an assessment and publish any security findings to an Amazon Simple Notification Service (SNS) topic. 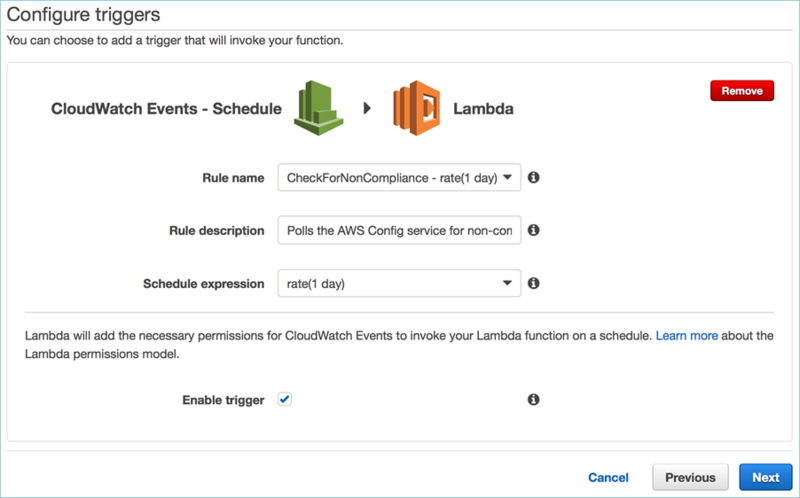 Then, you create an AWS Lambda function that is triggered by those notifications. Finally, the Lambda function examines the findings and then implements the appropriate remediation based on the type of issue. In a July 2016 AWS Blog post, I discussed how to integrate Amazon Inspector with third-party ticketing systems by using Amazon Simple Notification Service (SNS) and AWS Lambda. This AWS Security Blog post continues in the same vein, describing how to use Amazon Inspector to automate various aspects of security management. In this post, I show you how to install the Amazon Inspector agent automatically through the Amazon EC2 Systems Manager when a new Amazon EC2 instance is launched. In a subsequent post, I will show you how to update EC2 instances automatically that run Linux when Amazon Inspector discovers a missing security patch. Encrypting data at rest is vital for regulatory compliance to ensure that sensitive data saved on disks is not readable by any user or application without a valid key. Some compliance regulations such as PCI DSS and HIPAA require that data at rest be encrypted throughout the data lifecycle. To this end, AWS provides data-at-rest options and key management to support the encryption process. For example, you can encrypt Amazon EBS volumes and configure Amazon S3 buckets for server-side encryption (SSE) using AES-256 encryption. Additionally, Amazon RDS supports Transparent Data Encryption (TDE). Instance storage provides temporary block-level storage for Amazon EC2 instances. This storage is located on disks attached physically to a host computer. Instance storage is ideal for temporary storage of information that frequently changes, such as buffers, caches, and scratch data. By default, files stored on these disks are not encrypted. In this blog post, I show a method for encrypting data on Linux EC2 instance stores by using Linux built-in libraries. This method encrypts files transparently, which protects confidential data. As a result, applications that process the data are unaware of the disk-level encryption. Amazon S3 Access Control Lists (ACLs) enable you to specify permissions that grant access to S3 buckets and objects. When S3 receives a request for an object, it verifies whether the requester has the necessary access permissions in the associated ACL. For example, you could set up an ACL for an object so that only the users in your account can access it, or you could make an object public so that it can be accessed by anyone. If the number of objects and users in your AWS account is large, ensuring that you have attached correctly configured ACLs to your objects can be a challenge. For example, what if a user were to call the PutObjectAcl API call on an object that is supposed to be private and make it public? Or, what if a user were to call the PutObject with the optional Acl parameter set to public-read, therefore uploading a confidential file as publicly readable? In this blog post, I show a solution that uses Amazon CloudWatch Events to detect PutObject and PutObjectAcl API calls in near-real time and helps ensure that the objects remain private by making automatic PutObjectAcl calls, when necessary. Today we are launching Amazon Cloud Directory. This service is purpose-built for storing large amounts of strongly typed hierarchical data. With the ability to scale to hundreds of millions of objects while remaining cost-effective, Cloud Directory is a great fit for all sorts of cloud and mobile applications. As with everything at Amazon, the success of our security and compliance program is primarily measured by one thing: our customers’ success. Our customers drive our portfolio of compliance reports, attestations, and certifications that support their efforts in running a secure and compliant cloud environment. As a result of our engagement with key customers across the globe, we are happy to announce the publication of our new SOC 2 Confidentiality report. This report is available now through AWS Artifact in the AWS Management Console. Financial regulatory agencies are focused more than ever on ensuring responsible innovation. Consequently, if you want to achieve compliance with financial services regulations, you must be increasingly agile and employ dynamic security capabilities. AWS enables you to achieve this by providing you with the tools you need to scale your security and compliance capabilities on AWS. The following breakdown of the most recent cybersecurity regulations, NY DFS Rule 23 NYCRR 500, demonstrates how AWS continues to focus on your regulatory needs in the financial services sector. In online gaming, distributed denial of service (DDoS) attacks target a game’s network layer, flooding servers with requests until performance degrades considerably. These attacks can limit a game’s availability to players and limit the player experience for those who can connect. Today’s new Amazon GameDev Blog post uses a typical game server architecture to highlight DDoS attack vulnerabilities and discusses how to stay protected by using built-in AWS Cloud security, AWS security best practices, and the security features of Amazon GameLift. Read the post to learn more. The following list includes the 10 most downloaded AWS security and compliance documents in 2016. Using this list, you can learn about what other people found most interesting about security and compliance last year. 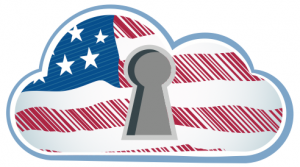 Three new services in the AWS GovCloud (US) region have received a Provisional Authority to Operate (P-ATO) from the Joint Authorization Board (JAB) under the Federal Risk and Authorization Management Program (FedRAMP). JAB issued the authorization at the High baseline, which enables US government agencies and their service providers the capability to use these services to process the government’s most sensitive unclassified data, including Personal Identifiable Information (PII), Protected Health Information (PHI), Controlled Unclassified Information (CUI), criminal justice information (CJI), and financial data. The following 20 pages were the most viewed AWS Identity and Access Management (IAM) documentation pages in 2016. I have included a brief description with each link to give you a clearer idea of what each page covers. Use this list to see what other people have been viewing and perhaps to pique your own interest about a topic you’ve been meaning to research. The following 10 posts were the most viewed AWS Security Blog posts that we published during 2016. You can use this list as a guide to catch up on your blog reading or even read a post again that you found particularly useful. You can use AWS security controls to detect and mitigate risks to your AWS resources. The purpose of each security control is defined by its control objective. For example, the control objective of an Amazon VPC security group is to permit only designated traffic to enter or leave a network interface. Let’s say you have an Internet-facing e-commerce website, and your security administrator has determined that only HTTP (TCP port 80) and HTTPS (TCP 443) traffic should be allowed access to the public subnet. 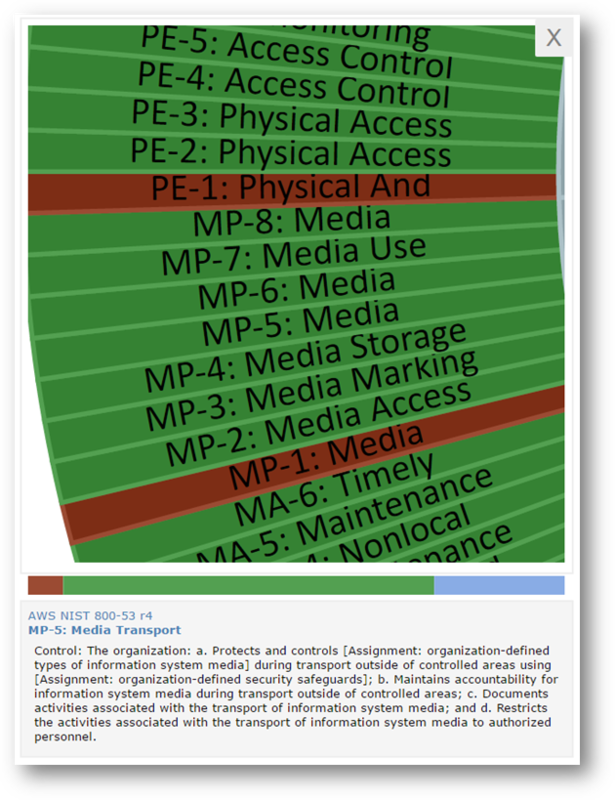 As a result, your administrator configures a security group to meet this control objective. What if, though, someone were to inadvertently change this security group’s rules and enable FTP or other protocols to access the public subnet from any location on the Internet? That expanded access could weaken the security posture of your assets. Consequently, your administrator might need to monitor the integrity of your company’s security controls so that the controls maintain their desired effectiveness. In this blog post, I explore two methods for detecting unintended changes to VPC security groups. The two methods address not only control objectives but also control failures. If you have questions about or issues with implementing the solutions in any of these posts, please start a new thread on the forum identified near the end of each post. This guest post is brought to you by Andrew Benjamin and Tim Sandage. It’s increasingly difficult for organizations within regulated industries (such as government, financial, and healthcare) to demonstrate compliance with security requirements. The burden to comply is compounded by the use of legacy security frameworks and a lack of understanding of which services enable appropriate threat mitigations. It is further complicated by security responsibilities in relation to cloud computing, Internet of Things (IoT), and mobile applications. Allgress helps minimize this burden by helping enterprise security and risk professionals assess, understand, and manage corporate risk. Allgress and AWS are working to offer a way to establish clear mappings from AWS services and 3rd party software solutions in AWS Marketplace to common security frameworks. The result for regulated customers within the AWS Cloud will be minimized business impact, increased security effectiveness, and reduced risk. 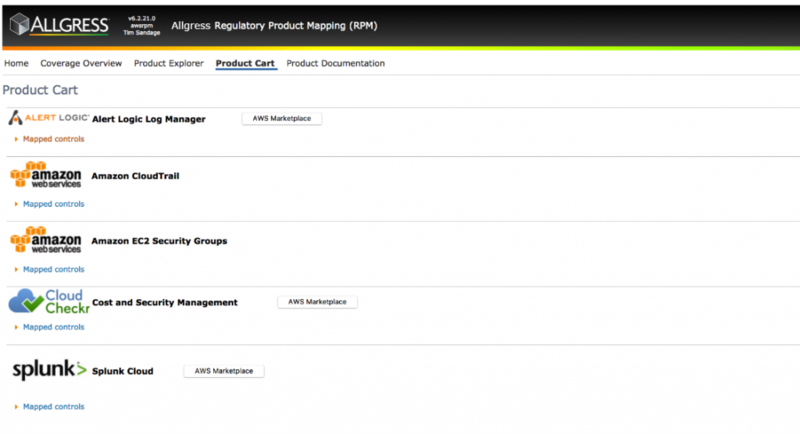 The name of this new solution is Allgress Marketplace Regulatory Product Mapping Tool (RPM). 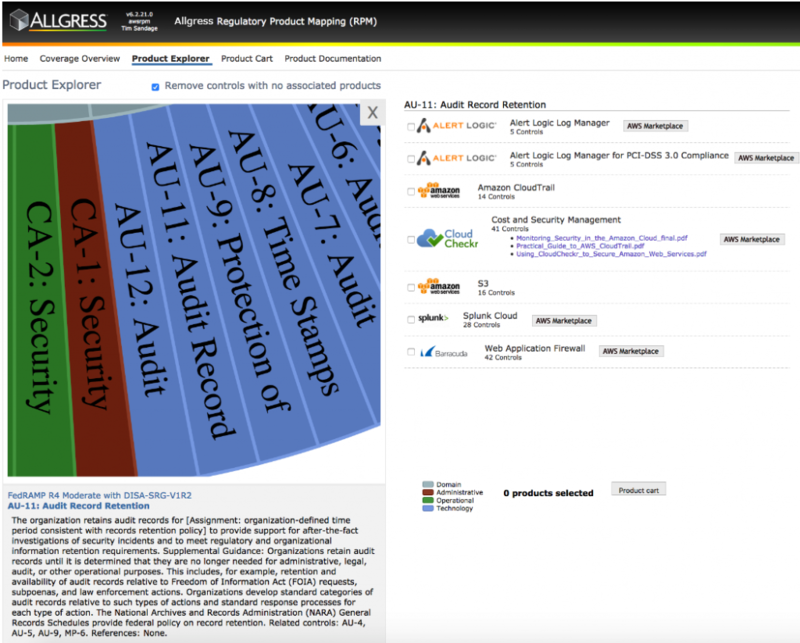 Allgress designed this tool specifically for customers deployed within AWS who want to reduce the complexity, increase the speed, and shorten the time frame of achieving compliance, including compliance with legislation such as Sarbanes Oxley, HIPAA, and FISMA. 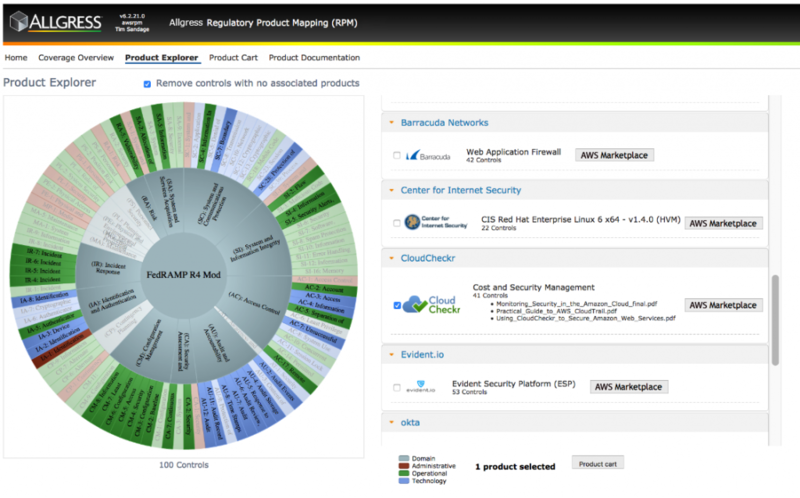 Allgress RPM is designed to achieve these results by letting customers quickly map their regulatory security frameworks (such as ISO, NIST, and PCI-DSS controls) to AWS services, solutions in AWS Markeplace, and APN technology partner solutions. The tool even guides customers through the compliance process, providing focused content every step of the way. 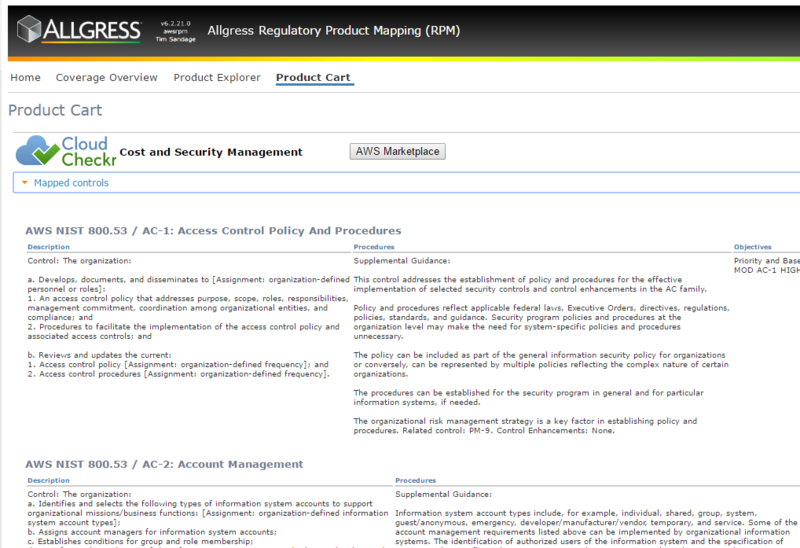 Once you’ve logged in, you can select your Regulatory Security Framework (e.g. FedRAMP or PCI). After you’ve selected your framework, you have two explorer options: Coverage Overview and Product Explorer (explained in detail below). The Coverage Overview includes three use cases: AWS customer controls review, regulatory requirement mapping, and gap-assessment planning. The Product Explorer tool provides detailed control coverage for the AWS services selected and/or all available AWS Marketplace vendor solutions. You can select Coverage Overview to review AWS Inherited, Shared, Operation, and AWS Marketplace Control mappings. AWS Inherited Controls — Controls that you fully inherit from AWS. Operational Controls – These are procedural controls that AWS or an AWS consulting partner can help you implement within your AWS environment. AWS Marketplace Controls — These are technical controls that can be implemented (partially or fully) with an AWS technology partner and vendors from AWS Marketplace. The additional capabilities within RPM is Product Explorer, which Identifies solutions in AWS Marketplace that can partially or fully implement the requirements of a security control. The screen below illustrates the 327 control for FedRAMP moderate — as well as several solutions available from software vendors on AWS Marketplace that can help remediate the control requirements. At the top of the page you can remove controls that do not currently have associated mapping. You can also zoom into Domains, Sub-domains, and Controls. You can select single products or multiple products with quick view options. 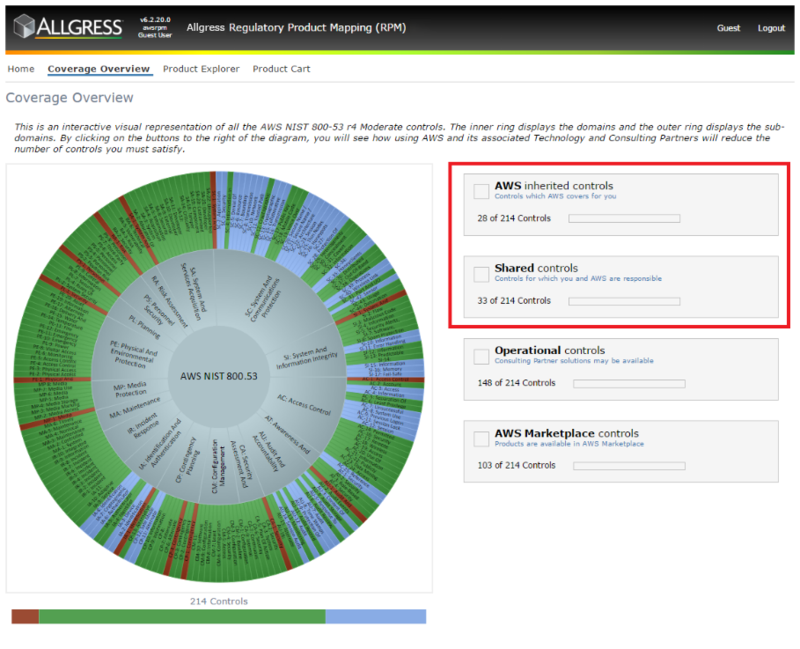 You can select single or multiple products, and then select Product Cart to review detailed control implementations. Product Explorer — Note: Non-associated controls have been removed in order to clearly see potential product mappings. Product Explorer — Zoom function for a specific control (e.g. AU-11) identifies all potential AWS services and associated products which can be leveraged for control implementation. 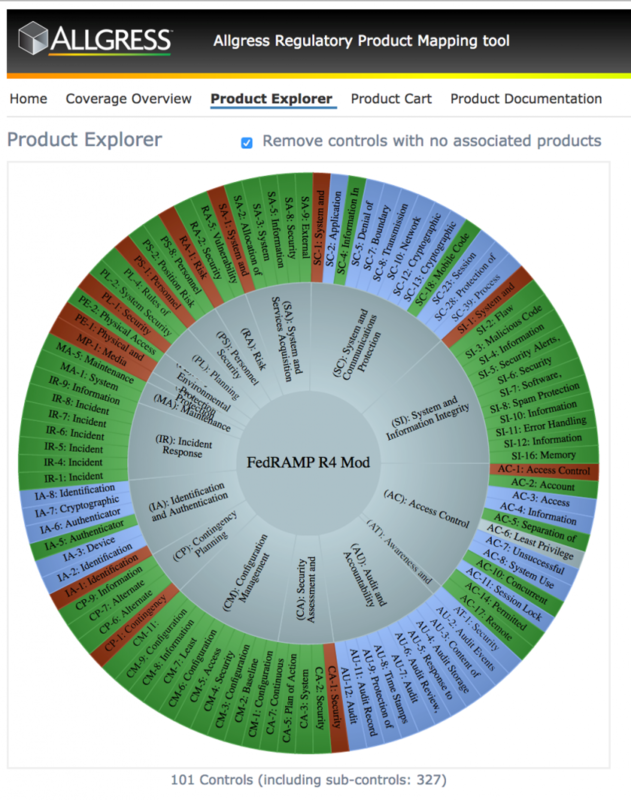 Product Explorer – Single product control coverage view. For a detail view you can Click on the Product Cart and view detailed implementation notes. Product Explorer – You can also add multiple services and solutions into a product cart and then connect to Marketplace for each software vendor solution available through our public managed software catalog. 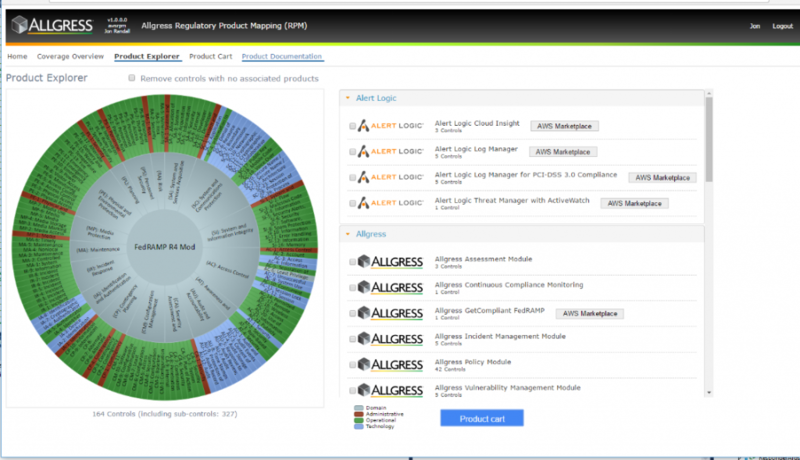 The AWS Services, Consulting, and Technology vendors that Allgress RPM is designed to map, have all demonstrated technical proficiency as a security solution, and can treat security controls across multiple regulated industries. At launch, RPM includes 10 vendors who all have deep experience working with regulated customers to deliver mission-critical workloads and applications on AWS. You can reach Allgress here. View more Security solutions in AWS Marketplace. Please note that many of the products available in AWS Marketplace offer free trials. You can request free credits here: AWS Marketplace – Get Infrastructure Credits. We wish to thank our launch partners, who worked with AWS and the Allgress team to map their products and services: Allgress, Alert Logic, Barracuda, Trend Micro, Splunk, Palo Alto Networks, OKTA, CloudCheckr, Evident.io and CIS (Center for Internet Security). -Andrew Benjamin and Tim Sandage. The following breakdown of the most recent cybersecurity regulations, NY DFS Rule 23 NYCRR 500, demonstrate how AWS continues to focus on your regulatory needs in the financial services sector. You can use your own encryption mechanisms for nearly all AWS services, including Amazon S3, Amazon EBS, Amazon SimpleDB, and Amazon EC2. Amazon VPC sessions are also encrypted. Optionally, you can enable server-side encryption on S3. You can also use third-party encryption technologies. Learn more about AWS KMS and feel free to bring your own keys. By achieving this milestone, our FedRAMP-authorized service offering now enables you to quickly and easily develop databases to not only manage data but also to secure and monitor access. You can address your most stringent regulatory and compliance requirements while achieving your mission in the AWS GovCloud (US) Region. Learn about AWS and FedRAMP compliance or contact us.